If you’ve spent any time over at the Warrior Forum, then you’ve most likely seen the tantalizing links that are scattered around for the War Room. So, what exactly is this Warrior Forum War Room and is it worth the money? This is exactly what I hope to reveal to you in the this Warrior Forum War Room review below. What is the Warrior Forum War Room? Basically the War Room is a private forum that only “Premium Warrior Forum Members” have access to. How do you get access to the War Room? How else, you have to shell out some cash! It’s actually quite a bit of cash too, and it has recently increased since the Warrior Forum’s acquisition by Freelancer. I actually joined the War Room several years ago and paid a one-time fee (I believe it was around $50, but don’t quote me on that) in order to join the War Room for life. That price has drastically increased. Now, if you want to join the War Room, you’re going to be shelling out a whopping $97 a year. That’s right, almost a hundred bucks each and every year. Surely, for something this expensive you are going to get a TON of value, right? Well, unfortunately, not really. If you check out the sales page for the War Room, then you will see promises of great opportunities that will “supercharge your online business” and that it is the ultimate online marketing toolbox to help you dominate the internet marketplace. So, how exactly are they going to help supercharge your business? The very first thing that they promise is access to “expert talks with internet marketing superstars” via guest appearances on webinars with an AMA theme similar to Reddit does it. There are some decent little pieces of knowledge in these WAMA (Warrior Ask Me Anything) webinars, but the problem is, they are far too sporadic to be worth $97 a year, and many of them are already outdated because most of the discussions are about latest trends in marketing which quickly get outdated. Originally, these WAMA sessions were supposed to be weekly, as you can see in the screenshot below. Unfortunately, as you can see from the next image, they have really failed to deliver on that original promise. Also, on top of failed consistency, you are going to be listening to about 60–90 minutes of questions before you find that one little piece of knowledge. Is there a way that you can listen to some of these folks without having to join the War Room? Oh, if only there were, right? Well, guess what, there is. The majority of the people that they interview in the WAMA sessions actually have their own FREE podcasts on their websites and the iTunes store. Free is a heck of a lot cheaper than $97, right? And it’s not nearly as hard to find some of the information, as each of the podcasts and blog posts have their own unique topic that they cover. Now, don’t get me wrong, there’s value to be had in the WAMA sessions. I just don’t believe that it’s $97 a year worth of value. What Else Can You Find in the War Room? If you can find a reputable (very few and far between) product within the War Room that teaches any specific subject, and it’s current, then maybe you can pick up a few tips. If you take a moment to look at the how the information is delivered inside of the War Room, then you will quickly understand why it’s so hard to find relevant topics. On top of that, when you do find a topic that you want to learn more about, you may be getting some really bad advice that can potentially cripple your online business. There are a lot of people who are steering people in the wrong direction by giving advice inside of the War Room, and even worse, there really isn’t any type of moderation system in place that makes certain the inaccurate advice is removed. This results in a lot of people causing potential harm to their businesses by following outdated or black hat methods in order to try and game the system. There’s a really BIG problem here. Many of these digital marketing courses are previous WSOs and if you’ve read any of our WSO reviews, you already know the caliber of a lot of these courses. While there are a FEW that offer neat tips, the majority of them are simple quick methods that are often taken from other websites on the internet and then sold for a quick buck. They are certainly not full blueprints that will help you establish an online business, but rather quick little tips and tricks that are designed to solve simple problems. 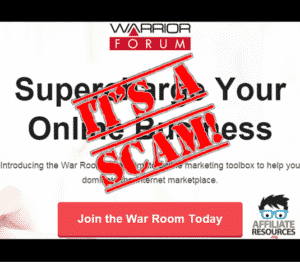 From email opt-ins to really crappy products, the War Room truly does stand up to it’s name. If you enter, then you are potentially putting the future of your online business square in the crosshairs of an air strike that will likely leave it lying in rubble. At $97 a year, the War Room leaves you in the trenches with no map or battle plan. If you are looking for some clarify among the debris of War Room, I urge you to have a look at Wealthy Affiliate because they have what you need to thrive.. and that is a clear support system for those who need it. It doesn’t matter if you are someone just getting started or a seasoned vetern of the Warrior Forum, anyone can benefit from Wealthy Affiliate because you get your questions answered MUCH faster than any other internet marketing community around. Have a look at this comparison and decide for yourself that Wealthy Affiliate is far superior than the War Room. I too tried out the War Room just to check it out and see why a lot of old-school IMers always talked about the Warrior Forum. I was unimpressed by the free version, so I thought maybe the paid version was where it was happening. I basically saw three things happening in there. Maybe if you’re super savvy you could pick through the garbage and find a few gems, but it’s definitely not a place newbies want to hang out. Jay, I’ve joined the war room back in 2009 for $37 (or $39) one time fee. I was a lot more active back then and I actually joined so I could get some freebies from that part of the forum (and I did get some original royalty-free music, some photoshop graphics, etc). … but eventually I stopped logging in because most of the content in the war room was simply re-hashed old info. As you mentioned there are some gems and great info here and there but I totally agree that 97$/year is quite a bit exaggerated. Their idea is good but I believe they need to work a lot harder and offer a LOT more info if they want to charge a recurring fee. Thanks for the good review. I have never joined the War Room, but I have visited their forum frequently and always wondered about it. I had reservations and your review clinched it for me. I have, however, joined Wealthy Affiliate and am a premium member. This was definitely worth it. My thoughts exactly! I bought maybe one or two WSO’s in my early Hunt For The Internet Marketing Golden Goose – and boy did I get scammed! One course was supposed to teach you all the tricks to making millions on the dark side of the ‘net. I shelled out for it (OK – I know – curiosity killed the cat!) and found that it was a 10-page ebook with some extremely basic info and to get the whole deal, you had to sign up for a massively expensive ‘upsell’. Duh! Was about as credible as minions! Thanks for the review here..and you know what? I am still a member with Warrior Forum 🙂 Been there long time ago. I compile lots of free ebooks and paid some of the programs that promise you to make tons of money…(Junk). I was a Warrior Room member for 3 years and wanted to cancel my membership less than 24 hours after they billed me for the 4th year for about $100 and they refused to refund me. I had already paid for 3 years and barely ever went to the site and they wouldn’t refund my 4th year after I asked to close my account less than 24 hours of the billing. Scumbags for sure. Who runs a business like that?